Catch exotic fish, join a clan and smash crystals on your favorite Apple device! There are plenty of action games for iPhone and iPad, the majority of which are free-to-play. With this in mind, make sure you download these five titles. The developer says: Journey to the world's most beautiful destinations and fish for real in paradise! 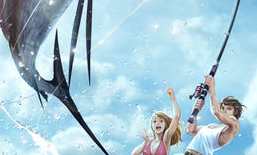 Jump into paradise blue and experience the ultimate 3D fishing adventure! The developer says: Supercell-the maker of fan favorite Clash of Clans-delivers another highly enjoyable mixture of strategy and tactical action with Boom Beach. Fortify your island base with real-world weaponry, manage your economy, and amass armies to storm enemies' beaches and seize their resources. To succeed in destroying other players' strongholds, you'll need to think strategically and make smart decisions on the fly. Boom Beach offers polished, compelling gameplay enhanced by excellent sound, an amusing visual style, and easy-to-use controls.